Are you one of those people who will bookmark a recipe, but never make it? I have an entire 3 ring binder dedicated to this unfulfilled habit. It dates back 10 years, categorized with colorful tabs and laminated pages. Yes, laminated pages. Plenty of thought and effort went into this creation and I barely even use the darn thing (hi, my name is Emilie and I’m a recipe hoarder). It’s like a show piece. Anyway, focaccia has been on my to-do list for a while now. After spying some focaccia recipes online and leafing though my stash of crinkly magazine cut-outs, I was summoned. 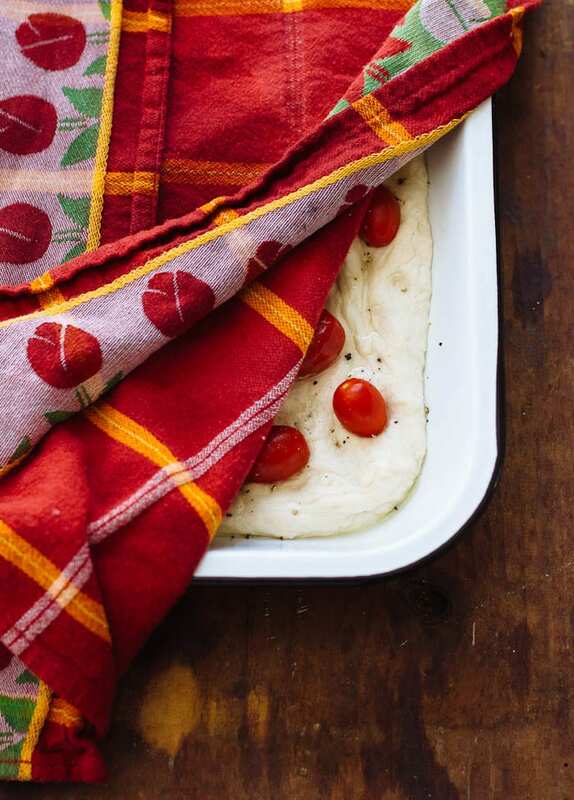 If you’re new to bread baking, focaccia is an excellent place to start. You don’t need a bread machine or sourdough starter. My focaccia requires two hands and fast-rising yeast. As much as I enjoy using sourdough in my baking adventures, there is a time and place for certain rising methods and here, commercial yeast suits me just fine. Not to mention, I have yet to dabble in sourdough focaccia so if you have any useful tips/pointers/comments drop me a line below. To begin, mix all of your ingredients together in a large bowl- I squish everything by hand. (Alternatively, mix the dough using an electric stand mixer fitted with the dough hook. Run the machine for 8-10 minutes on low speed). Cover the dough with a damp kitchen cloth and leave to rise on your cluttered kitchen table. Quick Tip: if you have to run out or can’t bake for whatever reason, stop here. Cover the bowl with plastic wrap and refrigerate overnight. The dough will rise in the fridge (yes, even if it’s cold- just at a slower rate). When you’re ready, bake the following day in the morning. Bread baking can be adapted to suit your schedule- take advantage of this tip. How long will the dough take to rise? If left out at room temperature, expect to wait anywhere from 1-3 hours depending on the temperature of your kitchen. The warmer it is, the faster it will rise. If you’ve chosen the overnight fridge rise 8-12+ hours is sufficient. For example: I made my dough at exactly 8 AM, took the kids to school, went grocery shopping, mailed something, and by 11 AM it was ready. Your dough should be 1 1/2- 2x it’s original size. Take a picture with your phone for a ‘before and after’ shot. 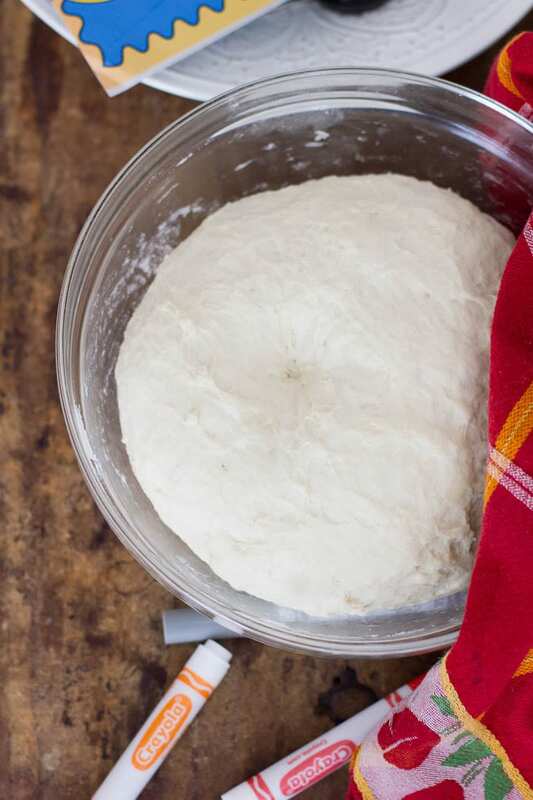 Quick Tip: poke a hole (gently) into the dough. If your finger mark stays indented, the dough is ready. 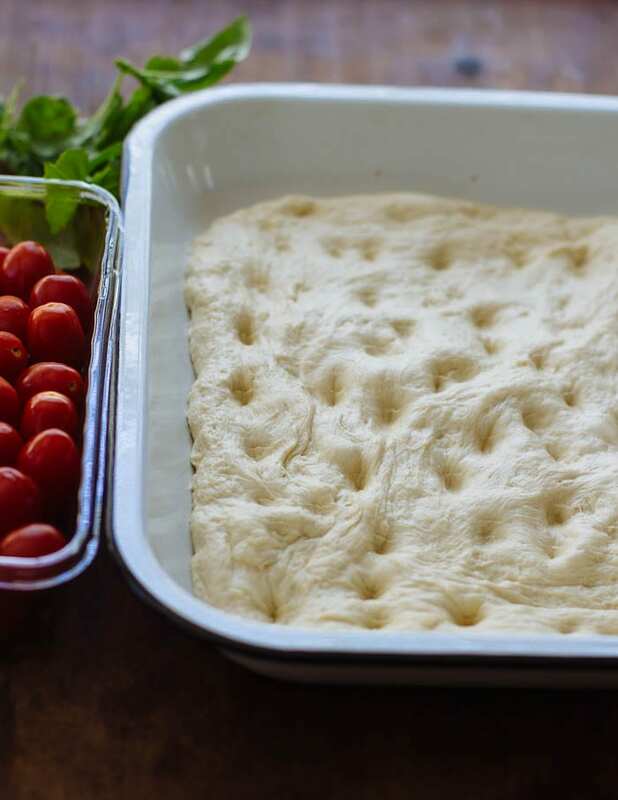 Place the dough into an oiled 9×13-inch baking dish. Gently stretch the dough extending all the way to the corners and sides. If there’s any resistance, the gluten is not relaxed; let it rest for about 10-15 minutes and try again. Then, poke holes into the dough and fill each one with a juicy cherry tomato. Really get in there and press it down so the tomatoes don’t pop off when baked. Let it rise again (the nerve!). But only for about 30 minutes or so, this time. The dough should look slightly puffed and less dense before it goes into the oven. Bake @ 400 F for about 35-45 minutes. At the halfway mark, add some fresh mozzarella for a cheesy, melty crust. 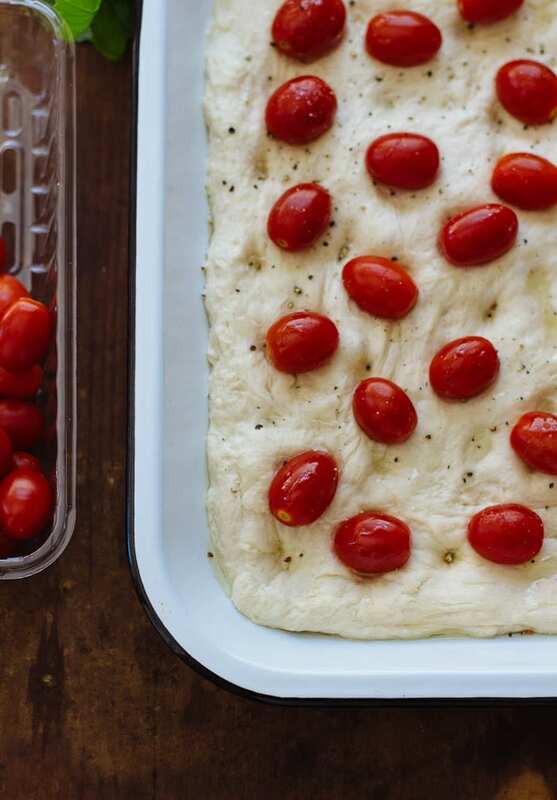 Allow the focaccia to cool for at least 30 minutes before diving in. If you slice it too soon, the texture will not be light and fluffy (trust me). Right before serving, sprinkle with fresh basil and cut into squares. Take one bite and you’ll be transported to bread bliss… a heavenly pillowy inside with a crispy bottom crust. Enjoy! What have you been making lately? Any recipe hoarders like me? The recipe below is (mostly) in grams. I find using grams is more accurate in bread baking. Also for accuracy, my ingredients are weighed using a digital kitchen scale. If using a glass pyrex baking dish decrease the oven temperature to 3375 F to avoid over browning. Lightly oil a 9x13-inch baking dish. In a large bowl, add the flour, salt and mix well to combine. In a separate bowl or glass measuring jug, add the water, yeast and olive oil. Mix with a fork to incorporate. Add the water mixture to the flour bowl. Get in there with your hands and squish everything together. The dough should come together in rough ball with little to no flour visible. You can't mess this up- just keep going until you've got a good mix. (Alternatively, mix the dough using an electric stand mixer fitted with the dough hook. Run the machine for 8-10 minutes on low speed). 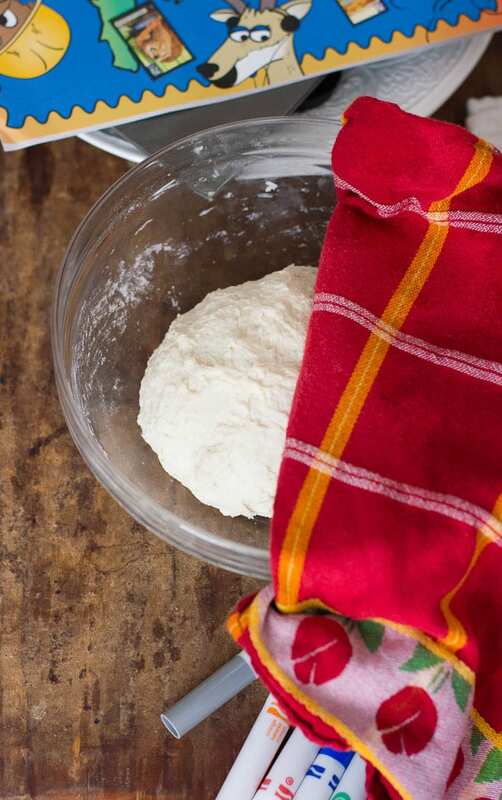 Cover the dough with a damp kitchen cloth and leave out at room temperature to rise. Your specific rise time will vary depending on how warm your surrounding temperature is. Expect to wait anywhere between 1-3 hours. Your dough is ready when it looks 1½- 2x it's original size. Take a picture with your phone to compare. (Alternatively, if you have to run out or can't bake for whatever reason, stop here. Cover the bowl of dough with plastic wrap and place into the fridge to rise overnight 8-12+ hours. Bake in the morning). When your dough has risen sufficiently and you are ready to bake, preheat your oven to 400 F (if using a glass baking dish, preheat to 375 F). Place the dough into your oiled baking dish. Gently stretch the dough, extending to fit the corners and sides. If there is resistance or your dough shrinks back when stretched, the gluten is not relaxed; let it rest for 10-15 minutes and try again. Poke several holes into the dough. Place a cherry tomato into each hole (approximately) pressing down as you go. If the tomatoes fit snuggly they won't pop out when baked. Sprinkle lightly with salt and pepper, and drizzle the top with olive oil for a nice, golden crust. Let the dough rise again but only for about 30 minutes or so, this time. It should look slightly puffed and less dense before it goes into the oven. Bake in the oven for 35-45 minutes. At the halfway mark, add the fresh mozzarella. 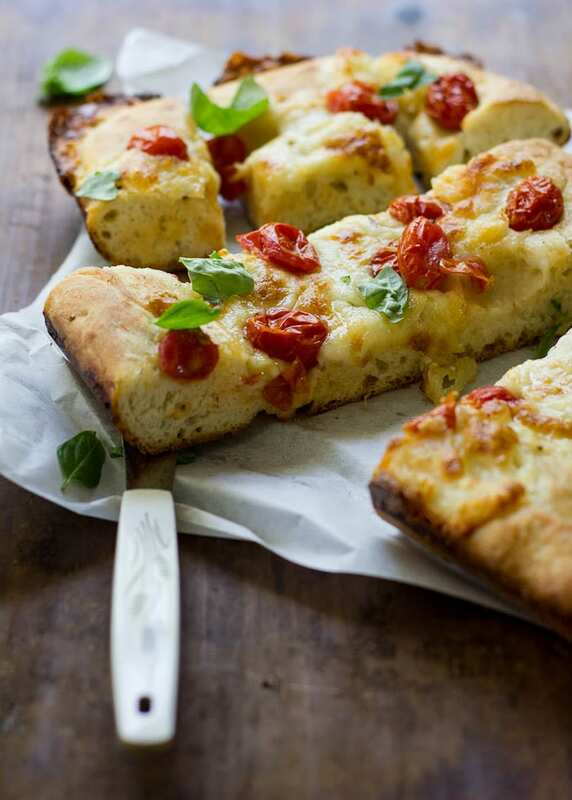 Your focaccia is ready when beautifully puffed and golden. Remove from the oven and let it cool for at least 30 minutes- 1 hour for best texture. Don't rush this step- you want the inside to remain light and fluffy. 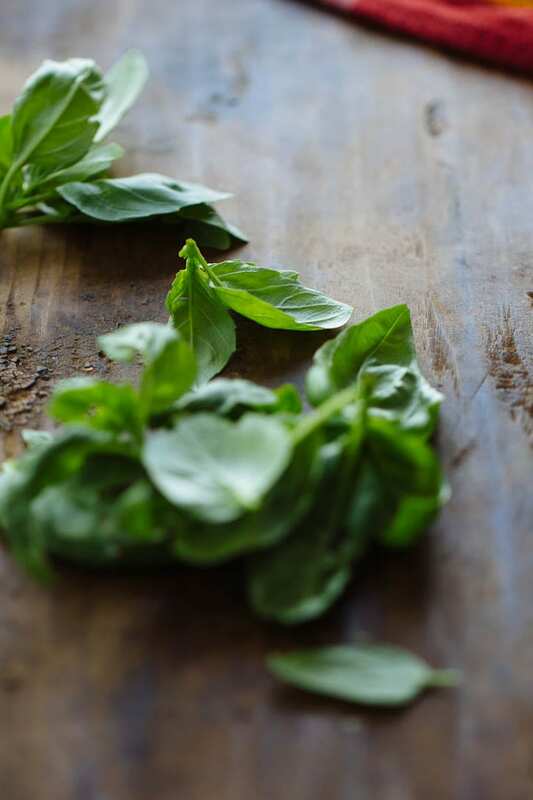 When ready to serve, tear some fresh basil leaves over the top, cut into squares and enjoy! Previous Post: « a cat, her dough, and a pile of greens. You are too funny. I can definitely post at night, but not sure if anyone will actually read it (except you… haha). Perhaps I should take a poll? mmmmm focaccia is the bessssst, especially when it’s no-knead!!! What a delicious snack for this summer! Definitely pinning this for later! You’re so right. Who doesn’t have a folder or binder full of recipes!? And so many forgotten! One of these days I’ll get to some of those gems. This no knead looks simply delicious. Can’t wait to try. Haha yes I might have problem with recipe hoarding as well. :) This recipe looks so good. I think I’ll make it today! Love that this is no knead! And that flavour sounds perfect! I love focaccia!!! This is a recipe I’d bookmark and make! I could live on this all summer long :). You always inspire me, Emilie! It’s been too long since I made focaccia, at least a year and I’ve not made it with tomatoes. This needs to change. One of the best sandwiches of my life was on focaccia. Love how bread works on your time… my problem is I can’t seem to leave it alone while it’s rising; I love watching it, all those air bubbles on the surface, slowing making the bread so tasty. I gotta move on because I get very little done on bread day! Thank you for this, Emilie. Funny how it’s nearly impossible for us to forget an amazing meal, right? I think I can remember every meal I’ve ever had at a good restaurant, feast, or gathering and if we dined together, I’d remember what you ate too. It’s like a curse. I bet that focaccia sandwich of yours was killer. Oh, and I’m a dough stalker too, absolutely. That’s why I do the long overnight rises in the fridge; all the work is done while you’re asleep! yeah, I sometimes feel like the better part of my life ambition is in a dedicated binder ;-) get to it someday…ah, soon enough my boys will be on their way; until then I’m soakin’ it up. For a non-bread maker, you may be surprised (or not) to know that I’ve been making focaccia for some time now… love that no-knead aspect and the versatility… so many options from the same base recipe. Love the beautiful rise you got on your delightful caprese version and I can taste the goodness from your lush photos! Don’t we just love making focaccia? No-knead and no hassle as well if you ask me! The cherry tomatoes are lovely but imagine what more can you do to flavor up this bread – endless, right? No kneading required! This must be for me! Will try ASAP! I have a huge leather binder from Williams Sonoma that my husband bought me about 8 years ago, specifically so I would organize all my recipes. It’s even monogramed for goodness sake! I’ve organized about 30% of my recipes and the rest continue to fall out each and every time I reach for the binder!! Grrr!!! 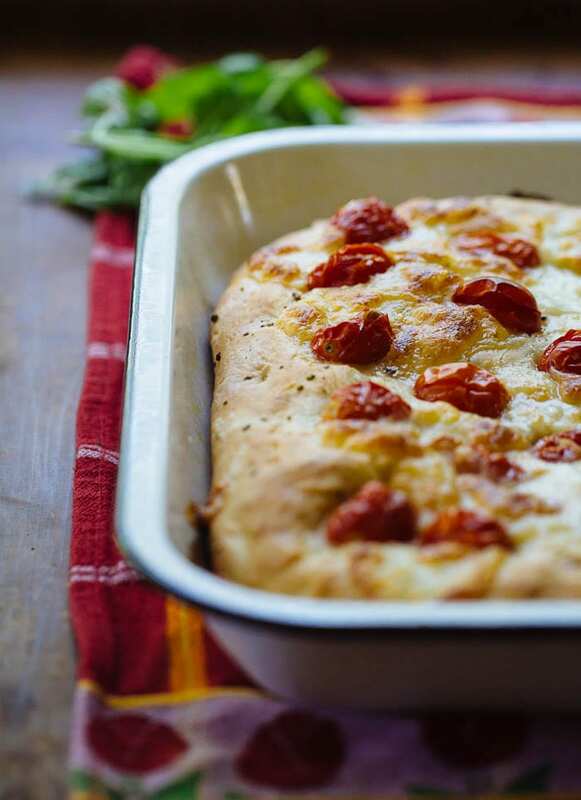 I’ve always wanted to make focaccia and never knew how! I may just give this a try! Thanks! yumm focaccia is one of my favorite things ever!! This is lovely!! I love focaccia and have never made it myself. It is officially on the to-do list thanks to your recipe! YUM! I have made a focaccia several times. It is always amazingly delicious, but it rises while cooking, so it is not as flat as it should be. It comes about triple in height. I can’t figure out why that happens. I can’t wait to try this no-knead version with tomatoes. Thanks Emilie! 1.) If you are comfortable with this, try adding additional water to the dough. It will spread more as it rises due to the higher water content. You’ll have to experiment with the exact amount of water needed- not too much though. 2.) Bake at a lower oven temperature. This will decrease its initial ‘spring’ once it goes into the oven. 3.) 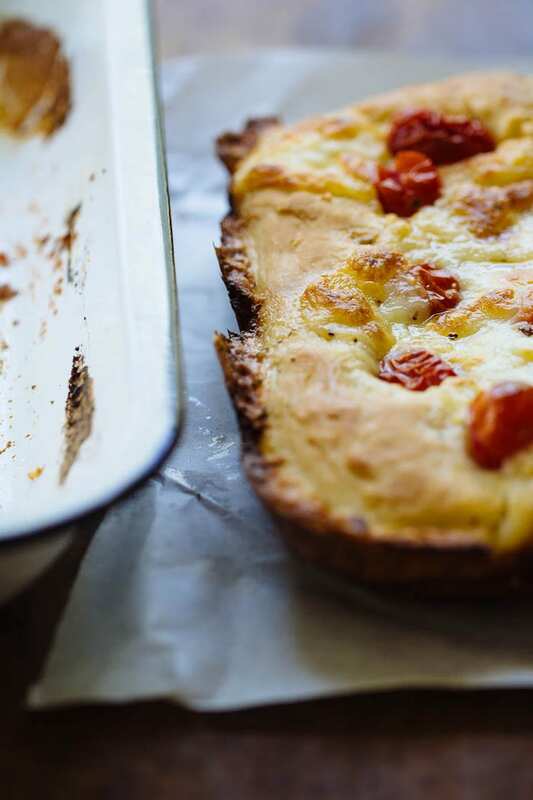 Bake your focaccia on a wider, rimmed sheet pan. This recipe uses a shallow pan- however the extra surface area on a sheet pan (cookie sheet) might help as well. I just wanted to let you know that I made this bread and my boyfriend loved it, and another is in the oven as I type. However, I have been following the saved recipe and just revisited this post to see that there is meant to be a second rising time I have missed both times as it isn’t in the recipe below. It still tasted great, but I wonder what the difference would have been! Yes, you are correct. I updated the recipe below, thank you for bringing it to my attention! The second rise time helps to lighten the dough, making it less dense when baked (as opposed to skipping this step). It also allows for the gluten to re-build its strength. In comparison to the initial rise, the 2 rise whether in this recipe or other recipes, will always be shorter- roughly 30 minutes or so. The dough should look slightly puffed before baking. Looks great and mouth watering…:) I am first time bread baker and I want to give this a shot since you said its an easy recipe. I have a quick question…should the water be warm to mix the yeast? Thank you for your patience. No, the water doesn’t have to be warm to mix the yeast. It will help speed things up in terms of rising, but is not necessary to make the recipe. The choice is up to you! Can I use whole wheat flour in place of the white flour? I realize it might be a bit more dense and require more water…. Hi there! I’m sure you could but I haven’t tested this myself. You will definitely need to increase the water, especially since this is a no knead recipe. No knead recipes require proper hydration or else they won’t work. I would google around for a proper whole wheat focaccia recipe and then follow my instructions for adding the tomato & basil. I just came across your blog and love it. 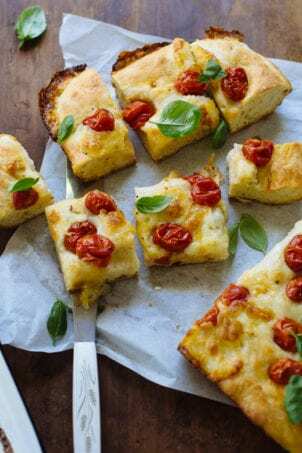 I would like to make this focaccia – do you think I could assemble two days before and bake the morning of? Or, if I bake ahead of time, would it last for two days before eating? Should I store it outside or in the fridge? I’d like to take it for a picnic. Thank you!